AMD Athlon II X4 620 PCSTATS Review - Bargain Basement or Real Steal? 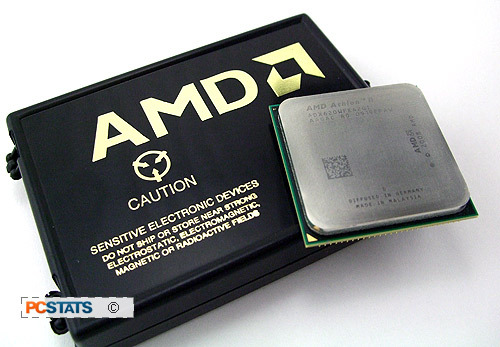 Abstract: The AMD Athlon II X4 620 is a 2.6 GHz socket AM3 chip destined for mainstream PCs. Bargain Basement or Real Steal? AMD has brought quad-core processing to the budget-minded mainstream PC user, once again underscoring a value-for-performance trend with its chips. At just $99, the Athlon II X4 620 processor is an affordable way to gain a computing advantage in multi-threaded applications, particularly with office-type work loads. Take into consideration the AMD 785G platform which compliments the quad-core chip quite nicely, and the value quotient is hard to beat. The lack of L3 cache has a negative impact most noticeably in gaming and applications like WinRar where the Athlon II X4 620 has difficulty keeping up. General-purpose (and faster-clocked) dual-core AMD Athlon II X2 250 and the triple-core Phenom II X3 720 Black Edition processors easily break ahead, as do the Intel Core 2 Duo E8400/8500 test systems. In the remainder of PCSTATS benchmark set the AMD Athlon II X4 620, on the whole, offers up consistently good results for its class - that being a mainstream desktop chip. In multi-threaded applications the Athlon II X4 620 is nearly as fast as AMD's triple-core Phenom II processor, and pulls ahead of Intel's Core 2 Duo processors in most, but not all benchmarks by a distinct margin. As mainstream processor go, the Athlon II X4 620 has a lot of headroom available for those looking to squeeze some extra GHz out of it..It only helps the cause to consider that the Athlon II X4 620 is inexpensive, doesn't require much power to run and overclocks like a dream. Without any voltage tweaks and using just a stock heatsink, PCSTATS had no difficulty overclocking this 2.6GHz chip up to 3.6GHz! An outstanding overclock in our books! AMD is pushing the Athlon II X4 CPU as a Windows 7 solution, and PCSTATS is confident that this processor will be enough to handle anything Microsoft's Windows 7 operating system will throw at it. In fact, the Athlon II X4 620 processor tends to be a tiny bit faster under Windows 7 than it is in Windows Vista. The minimum system requirements for Microsoft Windows 7 are a 1GHz processor, 1GB of memory, and a DirectX 9 videocard. When bundled with an AMD 785G chipset motherboard like the MSI 785GM-E65 or Gigabyte GA-MA785G-UD3H, the Athlon II X4 620 can dishes out appealing performance at a cost under $200. If you're on a budget (and who isn't right now?) and have been looking to assemble a PC for a home or office, look no further. With the confusion Intel Core i5 and Core i7 processors are bring to the table for Core 2 Duo users, it's worthwhile to touch on upgradability here. The Athlon II X4 620 is a socket AM3 part. It's compatible with AMD's most recent Socket AM3 motherboards and socket AM2+/AM2 motherboards as well. If you already own an AMD-based PC and want to make a quick and painless upgrade to quad-core processing, this is an affordable choice. Much has been made of AMD's inability to compete with Intel's fastest processors in the extreme enthusiast market. To be blunt, this is true. Yet while AMD has no ready answer for the Core i7 processor, it's also true that the majority of computer buyers will never need the power a Core i7 processor provides, or justify the cost of such a PC either. Judging by the latest road maps, AMD is focusing much of its efforts on infusing bang into budget-priced processors, so you might want to think twice about building a Core i5 LGA1156 PC right now. At PCSTATS we like fast CPUs just as much as you, but we also like making existing PCs run faster without spending a cent, and inexpensive PC hardware that's a great value. You have to look no further than PCSTATS Beginners Guides to see we're serious about this. AMD is focusing on the area that matters most to people, the bottom line. By bringing a $99 quad-core processor to the market, it has created an alluring platform for mainstream computer users and average PC needs - work, web and video playback. Of course, the reality for today is that the Athlon II X4 620 is unbeatable at $107 CDN ($99 USD, £60 GBP), and it can already be found at certain e-tailers. While not the fastest chip in the stable by any means, those of you on a tight budget should give it, and by extension AMD's 785G platform serious consideration. Find out about this and many other reviews by joining the Weekly PCstats.com Newsletter today! Catch all of PCSTATS latest reviews right here. Pg 16. — Bargain Basement or Real Steal?